Nominate a Local Teacher to Win $100 from Office Max! 1. Nominate them through a blog post or on Whrrl. This Saturday on Sew Krazy @ 11:00am EST… We are making pajama pants! YAY! I will be demonstrating how to make a pair of drawstring pajama pants from start to finish. The pair I make will be a size 4-6 chilren’s size. I’m going to demonstrate how to use your home printer to create designer tee shirt prints! Later, hear my guest expert, Dan Bickford, tell us a bit about graphic design and the screen printing process. Dan is a graphic designer, a graffiti artist, and a friend of mine! 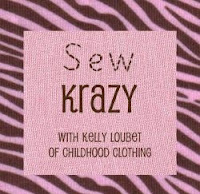 Tune in Saturday 11am EST to Sew Krazy Live on MomTV! I’ve recently been taken on as a Mom Writer at Type A Mom. This is really exciting for me as I’ve always been impressed what Kelby @TypeAMom puts out there. Type A Mom is a place for moms of all stages of life to share their stories. I’m honored to be included in this bunch! If you haven’t had a chance yet… take a peek at my first article!